Apparently I jumped the gun a bit on posting about the weather last week, but it’s just as well. You really don’t want to hear about (or see) the nasty slush, mud, snow drifts, ice floes, and dangerous flying detritus (icicles, tree branches, etc.) we are dealing with here as we lug food and water to the chickens and cart their eggs back. 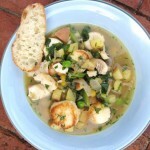 If you’re in the mood for a hearty chowder but are cooking for a vegetarian crowd, visit Vegetariantimes.com for a story I did last year. 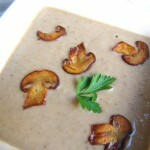 Recipes include Roasted Butternut, Squash, Apple, and Farro Chowder; Many Mushroom Chowder with Yukon Gold Potatoes and Rosemary; Caramelized Onion and Savoy Cabbage Chowder with Thyme; and Root Veggie Chowder with Collard Ribbons. 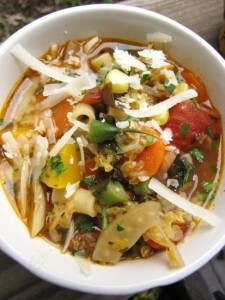 And right here on Sixburnersue.com, I’ve posted a few of my favorites from The Fresh & Green Table, including Asparagus & Leek Bisque, Spicy Noodle Hot Pot with Bok Choy, and a variation on my Farmers’ Market Minestrone. I’ve been working on more soups over the winter, too, and I have to say, they’re as satisfying to make as they are to eat. 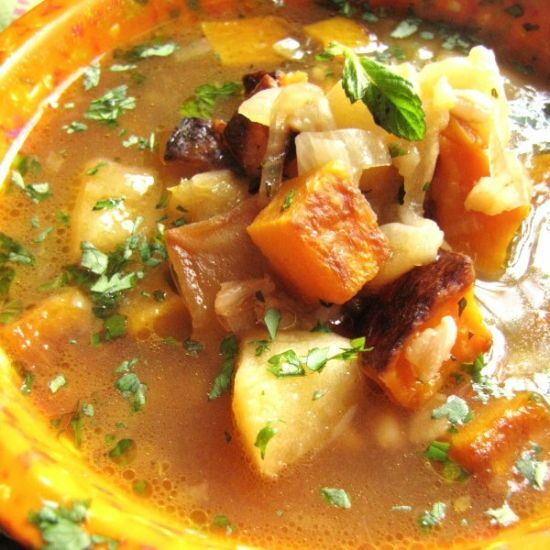 A tasty soup builds layers of flavors by starting with lots of aromatic vegetables (onions, carrots, leeks, garlic, ginger, celery, fennel—sautéed until golden, of course) and finishing with a few bright herbs and a splash of acid (vinegar or citrus). In between, broths get savory flavor from bits of meat, earthy green veggies and roots, bright tomatoes, hearty beans and noodles, and even the occasional rogue ingredient like a Parmigiano rind or a whole star anise. Understand where the flavor comes from, and you’re more than halfway to making a brilliant soup. And to forgetting about the damp and cold outside! I have made tomato soups every-which-way, and honestly, they’re all pretty comforting. But this one has a special zing and warmth to it that I love. I start with leeks and fennel, add lots of ginger and a bit of garlic, and then season with a combination of orange, coriander, honey, and balsamic (just a small amount) to give those bright tomatoes a sturdy backbone. 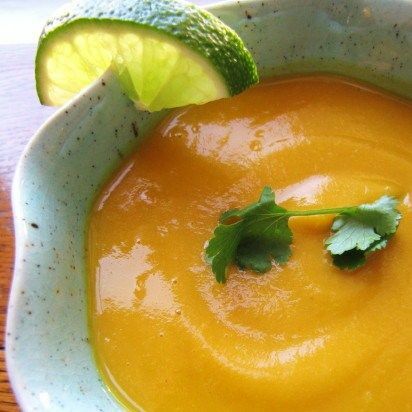 The magic of the blender produces a smooth, comforting puree, and just a little half-n-half gives the soup a silky finish. Garnish with crunchy rustic croutons or a dollop of crème frâiche. 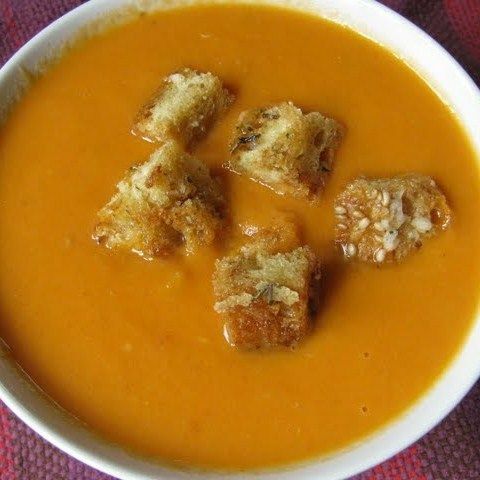 In a small bowl, combine the orange juice, honey, tomato paste, and balsamic vinegar. Set aside. Empty the contents of both tomato cans into a mixing bowl. Gently break up the tomatoes into smaller pieces with your hands (effective but messy!) or a pair of scissors. Add 1 cup water to the tomato mixture and set aside. In a 4- to 5-quart Dutch oven or other wide saucepan, heat the olive oil and butter over medium-low heat. Add the leeks, fennel, and 1 tsp. salt. Cover and cook, stirring occasionally, until softened, about 8 to 10 minutes. Uncover, raise the heat to medium, and continue cooking, stirring frequently and scraping browned bits off bottom of pan, until the vegetables are all browned in spots and the bottom of the pan is browning a lot, another 8 to 10 minutes. Take the pan off the heat and let the soup cool for 15 to 20 minutes. Puree the soup in three batches (fill the jar only about half way or just a little more) and cover the blender lid partially with a folded dishtowel (leave a vent opening uncovered to let steam out) to prevent hot soup from splashing on you. Combine the three batches in a mixing bowl, then return to the (rinsed) soup pot. Whisk in the half ‘n half. Taste the soup for seasoning and add more salt or pepper if needed. Reheat the soup very gently. Serve hot garnished with the Rustic Croutons. If my mom were here on Martha’s Vineyard with us this Sunday, this is what I would cook for her: Asparagus & Leek Bisque with Crème Fraiche & Tarragon and Classic Maryland Crab Cakes. 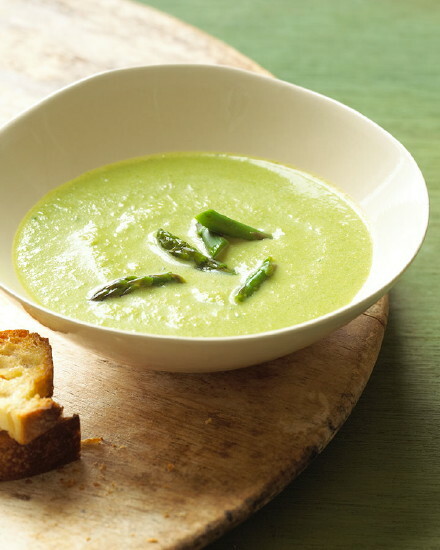 The silky soup (photo at right, recipe below and coming in The Fresh & Green Table) is delicious, easy to make, and would take advantage of the fabulous asparagus we’re now getting at Morning Glory Farm. The crab cakes, well, they’re a family thing. When I developed that recipe for Fine Cooking magazine several years ago, I had to consult each of my family members to make sure I did not adulterate any nostalgic memories. The recipe really should be called Evans Family Classic Delaware Crab Cakes, because we spent a lot of time crabbing, picking crabs, making crab cakes, and eating crab every summer in Lewes Beach, Delaware. 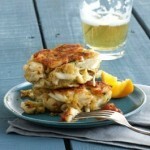 And for us, a crab cake is all about the crab (the blue crab!). Instead, I have to share this strange feeling I now get on Mother’s Day. I’m not a mother—well, at least, not an actual, bona fide legal full-time one. I always wanted to have kids, but it wasn’t to be. After I safely navigated my midlife crisis, I did briefly think about how I might still pull it off, but I never pursued any of the options. But God was looking out for me, I know now. Because into my life skipped Libby. 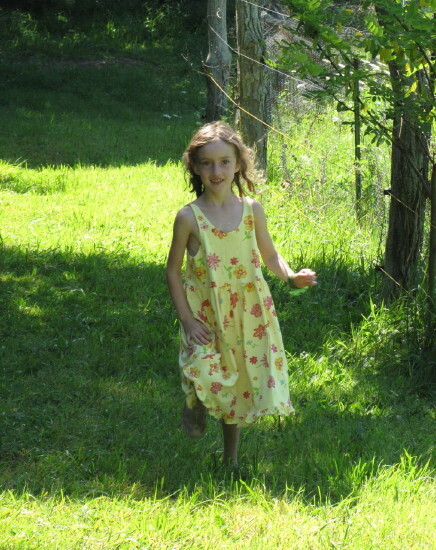 She was seven, almost eight when I met her for the first time (all maybe 40 pounds of her—hence her father’s nicknames for her – “Noodle” and “Peanut”). I spent just a few hours with her, but the next time she came out from Falmouth to visit her father, she said, “Daddy, can we go over to Susie’s house?” That was the start of a very good thing. For both of us (actually, all three of us), I do believe. Last year, Roy bought me a plant (a beautiful lupine) on Mother’s Day and Libby brought me a necklace she’d made. I was so surprised and blown away, really. Kelly told me this week that Libby had something for me this Mother’s Day, but since Libby’s got an “away” soccer game, we won’t see her until next week. Honestly, it is hard to describe how I feel about the fact that Roy and Libby honor me as the Mom in our little family unit, even though we are only all together for part of every month. We do make the most of our time together, though, and I guess that’s what counts. But having the gift of Libby in my life is not something I will ever fully grasp in a tangible way. It’s not to be analyzed, just appreciated. Nothing short of a miracle—and a real privilege to watch this amazing girl grow up. I will miss Libby this weekend. If she were here, we just might make that Asparagus Bisque and the Crab Cakes (she loves both). 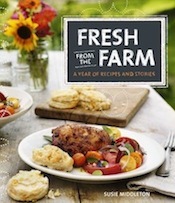 And I have something to give her, too—her very own copy of The Fresh & Green Table (I just got my early author copies). After all, it is dedicated to her and her Dad. And that’s pretty cool—how many nine-year-olds can walk into just about any bookstore and see their name in print? Well, this may be the first time for Libby, but I’m guessing it won’t be the last. Photographs in this post: soup, Annabelle Breakey, from The Fresh and Green Table; crab cakes, Scott Phillips from finecooking.com. 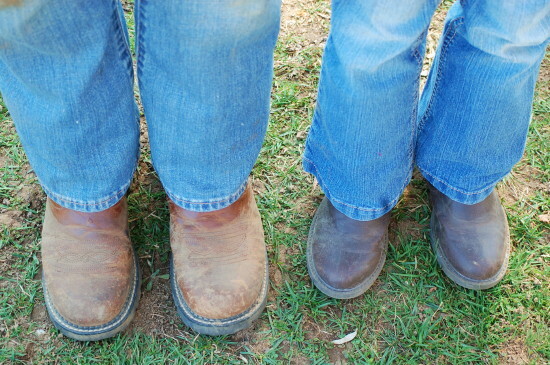 Boots by Roy Riley. This is a lovely, satisfying soup with the light flavors of spring, but the hearty back-up of earthy sautéed leeks. 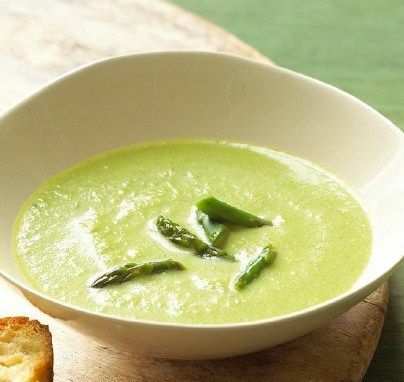 I love how well the crème fraiche, tarragon, and lemon work with the asparagus at the end. When you’re shopping for asparagus, you’ll probably want to go ahead and buy 4 bunches (of medium-thin stalks; bunches are about 1 lb. each) to be on the safe side (unless you find much bigger bunches!). You’ll be trimming all the tough ends to wind up with 1 1/2 pounds for the soup; plus you’ll be cutting up a few stalks to blanch and use as garnish. This soup would be lovely with a few crostini on the side, topped with warm goat cheese and maybe a little smoked salmon. 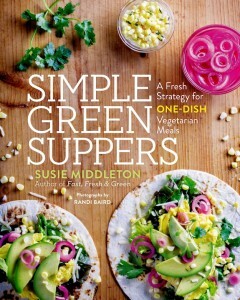 This recipe is from The Fresh and Green Table (Chronicle Books, June 2012, Susie Middleton). In a 4- to 5-quart Dutch oven or other large sauce pot, heat the butter and the olive oil over medium heat. Add the leeks, the celery, and 1/2 teaspoon kosher salt. 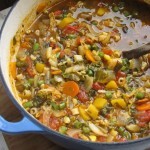 Stir, cover, and cook, stirring once or twice, until the vegetables are mostly softened, about 5 minutes. Uncover and continue to cook, stirring frequently, until the vegetables are shrunken and the leeks have taken on some golden color, about 7 to 8 minutes more. Add the ginger and stir until fragrant, about 30 seconds. Add the white wine and cook until mostly reduced (this will happen quickly). Add the (1 1/2 lb.) asparagus, 1 teaspoon kosher salt, and 5 1/2 cups water. Bring to a boil, reduce to a simmer and cook, uncovered, until the asparagus are just tender, about 7 minutes. Take the pan off the heat and let the soup cool for 15 minutes. Meanwhile, bring a small saucepan of water to a boil with 1/4 teaspoon salt. 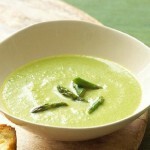 Drop in the extra asparagus pieces and cook until firm-tender but still bright green, 2 to 3 minutes. Drain and reserve. Reheat the soup very gently. Serve hot garnished with the reserved asparagus pieces. Promises, promises. A few weeks ago, I said I would give you a peek at some of the recipes in The Fresh & Green Table (coming in June—preorder now!). Last week I said I’d let you know what new greens we’re growing this year. Time for me to keep my promises, don’t you think? Especially since the green factor is blowing me away right now. 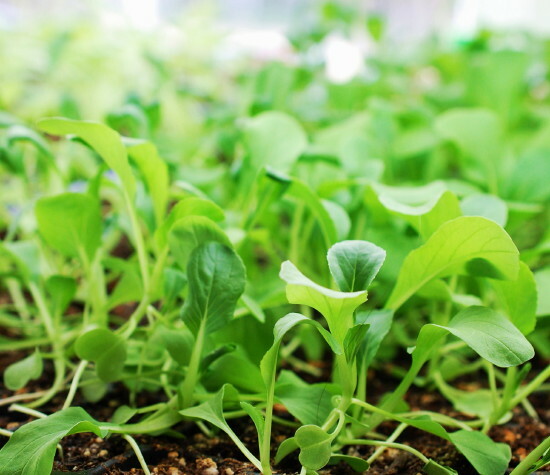 The seedlings we started three weeks ago are so fresh looking that it’s hard not to think about eating them right out of the flats! (The new light system has worked beautifully.) But some of those little guys—like the Rainbow Lacinato Kale and the Bright Lights Swiss chard—hold the uh, promise, of growing all summer and fall, with many many harvests along the way, so it wouldn’t be too smart to cut their little lives short just now. 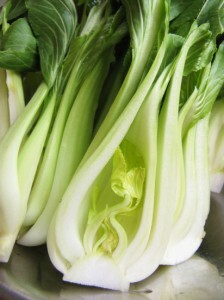 In honor of all these greens—especially the dozens of little baby bok choys we’ve started—I thought I’d include a delicious and easy recipe from the soup chapter of The Fresh & Green Table that features bok choy. (Recipe at end of blog.) I call it “Spicy Noodle Hot Pot with Bok Choy, Shiitakes, Ginger, Lime & Peanuts,” but it’s really just a quick and tasty noodle soup that you could make tonight (with regular or baby bok choy). 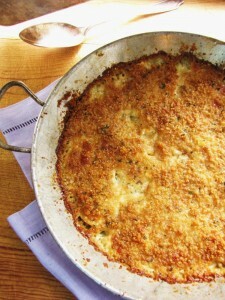 (I’m sorry I don’t have access right now to the beautiful picture of this dish that appears in the book.) 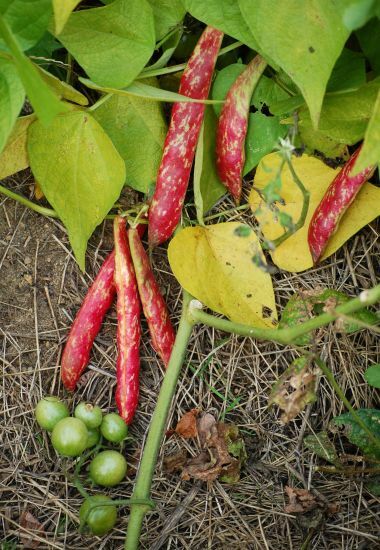 As it happens, this week three more recipes from The Fresh & Green Table were posted on the Internet, thanks to an article in the Spring issue of Martha’s Vineyard Magazine, Home and Garden (by yours truly). The three over there are for main-dish salads—most appropriate for grilling season. 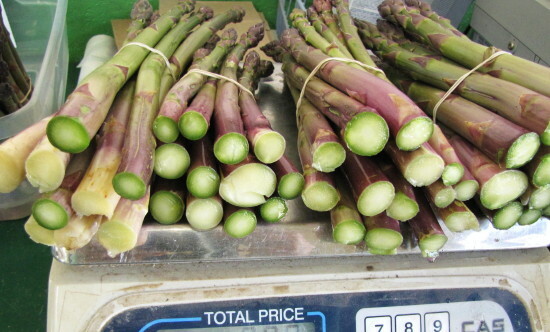 But one of them happens to feature asparagus and another Asian green, Napa cabbage, and would be perfect to make right now if you live in an area of the country that is already seeing local asparagus. 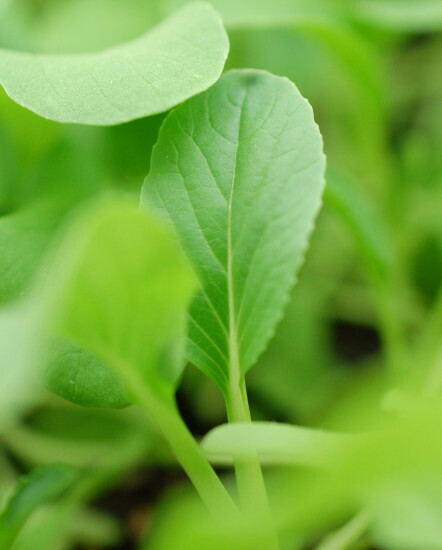 Komatsuna: This winter, I read about this intriguing Japanese green (also called spinach mustard) in The Seasons on Henry’s Farm. Then I began seeing references to it in all kinds of places so decided I’d love to give it a try. 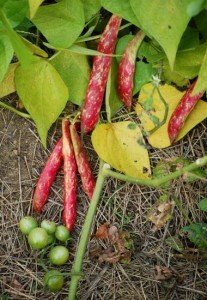 Supposedly the leaves are glossy and do not really wilt when cooked. 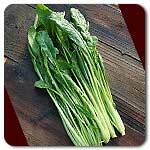 A turnip relative, the greens are best picked young and tender to be at their sweetest. Te Yu Flowering Broccoli: Years ago, Chinese broccoli was on my radar when I lived in New York. But I never grew it. I’m excited to give it a try this spring before the hot weather comes. It is fairly stemmy with little florets, but should be very tasty. Mibuna: This delicate and very early green is quite similar to Mizuna except that the tips of the leaves are rounded rather than serrated. I’ll plan to use this in salads as soon as I can. I also got all excited about the new frilly varieties of mustard I saw last year, so I wound up starting seeds for three of those—Ruby Streaks, Golden Frill, and Pink Lettucy. I know, I know, what was I thinking? One would have been enough. Pirat Butterhead: A beautiful heading lettuce with pale green inner leaves, lime green outer leaves, and red tips. Sometimes called Pirate lettuce (I don’t know why, matey), this German heirloom is supposed to be very flavorful, so I can’t wait to try it. Revolution: I’m hoping this red frilly Lollo-Rosso style lettuce will grow a bit more vigorously than others I’ve tried in the past. 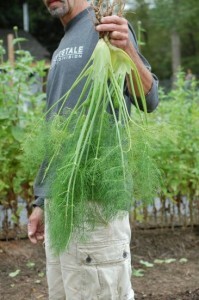 It should be a stunning addition to our farm stand mix. Kinemontpas Butterhead: This French heirloom supposedly grows into giant deep-green buttery heads if you can resist picking it before then. Yes, I have a knack for choosing the hard-to-pronounce varieties. Antares Oakleaf: The Fedco catalogue calls this, “A shimmery pink and bronze oakleaf growing vigorously to magnificent size. 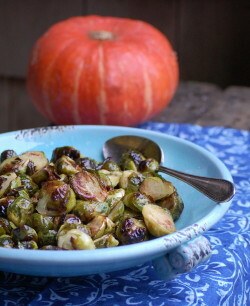 The extra-frilled finely cut bright leaves are colorful and tender, not bitter even in early July.” Another one to look forward to! I hate to tell you how many more greens we are growing other than those I’ve mentioned here. Despite doubling the size of the market garden, we are still going to be tight on space. Hmmm… maybe it would help if I promised not to take up too many beds with the greens. Promises, promises. We’ll see! 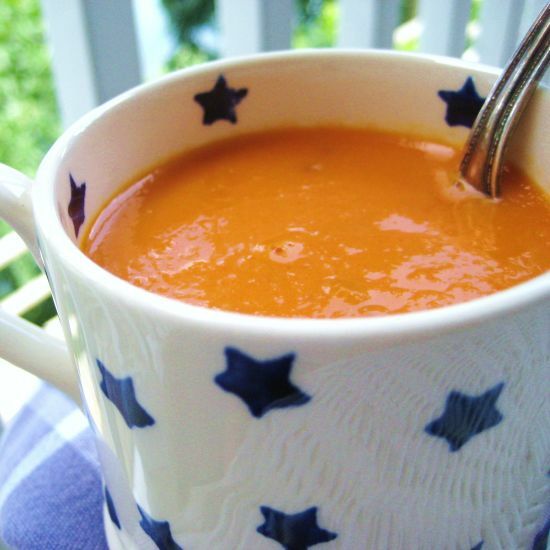 For such a quick soup, this one is darn satisfying. Thanks to the bold flavors of ginger, lime, soy sauce, and cilantro—and the intriguing flavor of one of my favorite greens (bok choy)—the soup packs a punch without much fuss. I do take one extra little step of sautéing the shiitakes separately in a nonstick pan; otherwise they can stick before browning or cooking through. I also take a clue from Asian cooks and boil the soup noodles separately. (They can soak up a lot of liquid if added raw to the soup. This works out nicely, as it means you can distribute the noodles evenly among four soup bowls and then add the tasty broth, the greens, and the fun condiments. 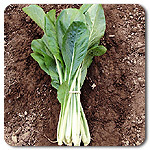 Heads of bok choy vary tremendously. You can use any size; just cut off a bit of the bottom, quarter lengthwise, and slice crosswise. Use plenty of the leafy tops, where there is lots of flavor. If you can’t find fresh Chinese egg noodles (in the produce section of the grocery), substitute with another fresh egg pasta (such as Italian linguine or fettucine). Bring a large pot of salted water to a boil. Add the egg noodles and cook until tender, about 2 to 3 minutes. Drain in a colander, rinse briefly, and let dry a bit. Transfer to a bowl and toss with a big pinch of salt and the sesame oil. In a small bowl, stir together the soy sauce, lime juice, and brown sugar. Set aside. In a medium (10-inch) nonstick skillet, heat 2 tsp. of the oil over medium-low heat. Add the shiitakes and a pinch of salt and cook, stirring, until tender and just starting to brown, about 6 to 7 minutes. Remove from the heat and reserve. 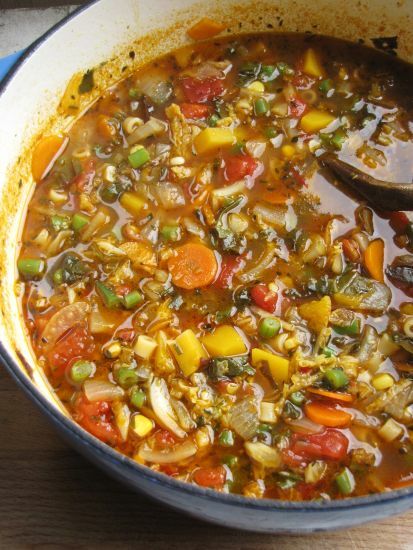 In a 4- to 5-quart Dutch oven or other soup pot, heat the remaining 2 Tbsp. oil over medium-low heat. Add the shallots and a pinch of salt, and cook, stirring, just until the shallots are softened and many are browning, about 3 to 4 minutes. Add the bok choy and 1/2 tsp. salt, and stir until all the leaves are wilted, about 2 minutes. Add the garlic, ginger, and chili-garlic sauce and stir until fragrant, about 30 seconds. Add the cooked shiitakes, the chicken broth, and two cups of water to the pan. Bring to a boil, reduce to a simmer and cook for 5 minutes. Remove the pan from the heat and let sit for 5 minutes. Stir in the soy-lime mixture and 2 Tbsp. of the cilantro. Distribute the noodles evenly among 4 deep soup bowls. 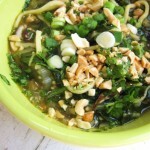 Use tongs to arrange most of the greens over the noodles in each bowl, and then ladle the remaining broth and soup contents into each bowl, distributing evenly.Garnish each bowl of soup with more cilantro, the scallions, and the peanuts. Serve right away with both a fork and spoon. 1. Slice celery root into thin matchsticks (or grate it coarsely) and toss it (raw) into a winter salad of endive, sliced pears, toasted walnuts, and blue cheese. 2. Make roasted celery root “chips.” Slice the root in half and then into quarters; then slice each quarter as thinly as possible. (A santoku knife is great for this). Toss the pieces in enough olive oil to coat, sprinkle with salt, spread on a heavy-duty sheet pan; and roast at 350°F until they are mostly a deep golden brown, with some white left. 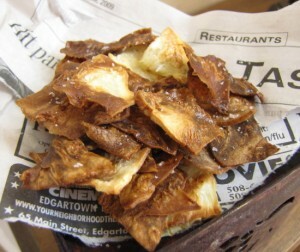 (I think the darker ones are crispier, but too dark and they’ll taste bitter.) Let them cool on the sheet pan to finish crisping up. Sprinkle with more salt and snack on the couch with your favorite DVD. 3. Since celery root and potatoes are such a great match, use them together in a hearty winter soup. Sauté lots of sliced leeks in butter, add cubed celery root, potatoes, and chicken or vegetable broth, simmer until tender, puree, and enhance with a touch of cream, a little lemon zest, lots of chopped fresh parsley and crispy croutons. 4. Apples and celery root are also happy partners. 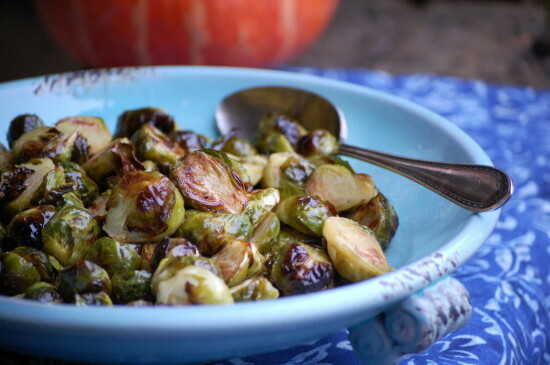 Use them raw together in a salad, or try roasting them first and adding them to a warm escarole salad with crispy strips of ham and a warm Dijon vinaigrette. 5. Make a celery root “galette” by lining a tart pan with a couple layers of thinly sliced circles of celery root and gruyere cheese. Bake at 400°F until browned and tender. (Cover for the first half of cooking.) Let cool and slice into wedges. 6. Try a “quick braise” of celery root. Brown diced celery root in a combination of butter and olive oil in a sauté pan, then add just enough liquid (a little broth spiked with apple cider), cover and reduce the liquid to finish cooking the vegetables. Uncover, toss with a little spiced butter, and serve warm. 7. Instead of chips, you can also dice celery root for roasting. Make a quick weeknight side dish of roasted celery root and Yukon Gold potatoes with honey and rosemary. Cut the vegetables into ½-inch dice, toss in olive oil and salt, and roast on a sheet pan at 425°F until browned and tender. Dress lightly with a combination of melted butter, honey, and chopped fresh rosemary. 8. 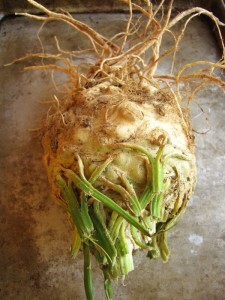 Celery root is also a good flavor match with seafood. A bed of celery root puree for a sear-roasted fish filet is delicious. 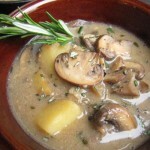 Cut the root (and a few small potatoes) into pieces and simmer them with a few small garlic cloves until tender. Puree the vegetables with a little of the cooking liquid, a bit of cream, and salt and pepper. 9. Instead of a puree, make a celery root “mash” by hand-mashing cooked celery root and potatoes together with butter and milk and a little sautéed garlic. Serve with pot roast. 10. For an elegant holiday side dish—or even a hearty weeknight main dish with a salad—make my recipe for a celery root and potato gratin I use a combination of heavy cream and chicken broth so it is rich but not too heavy; this is a good dish to introduce celery root to folks. A while back I posted my favorite way to cook fingerling potatoes–the stovetop braise–and a yummy sample recipe, Braised Fingerlings with Crispy Sage and Tender Garlic. 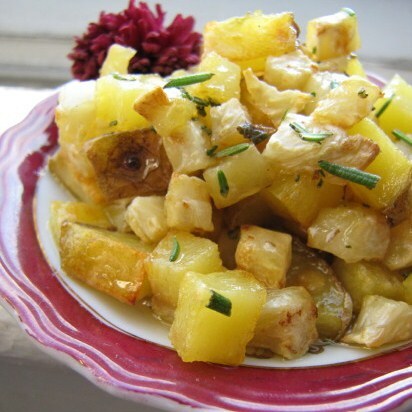 But the reality is, thanks to my CSA at Whippoorwill Farm here on Martha’s Vineyard, I was swamped with fingerling potatoes last summer and fall, so happily, I have a few other suggestions for using them. I figured I’d pass them on to you here, as many are good options for winter cooking, too. Boiled fingerlings hold their shape really well, so use them (cut in half or other pieces) in warm salads (like with frisee, bacon, and a poached egg or a garlic crostini) or other composed salads like a grilled tuna or salmon Niçoise. Cut into a few chunks and boiled, fingerlings are then perfect for “crushing” or smashing with roasted garlic and a bit of cream (or sour cream), butter, and chives. These smashed potatoes make a perfect bed for beef stew. Make a quick and delicious fish chowder by starting with sautéed leeks, simmering chopped fingerlings in the same pot, adding corn kernels and pieces of cod or haddock, and finishing with chopped fresh dill, a dash of cream, a squeeze of lemon, and lots of fresh pepper. If you like the hands-off cooking of oven-roasting, don’t despair. 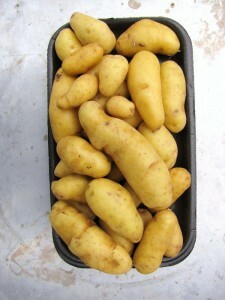 You can oven-braise fingerlings by laying them flat, cut-side down, in an oiled Pyrex baking dish. Season with salt, dot with a few dabs of butter, and pour enough chicken broth in the pan to cover the potatoes. Cover with aluminum foil and cook (at about 375°F) until the potatoes are almost tender. Remove the foil and cook until the broth has reduced almost completely and the potatoes are browned. There’ll be some nice glazy stuff on the bottom of the pan. Dice fingerlings and sauté slowly in lots of oil in a cast iron skillet until browned all around and tender through. Season with lots of salt. Voila, crispy “fried” fingerlings. Add sautéed onions and crush a bit for a more hash-like dish. Most fingerlings have such outstanding “potato” flavor (nutty, earthy, and rich), that they’re perfect in cold potato salads, too. Try one with fresh peas, mint, and a light lemony-mayonnaise and yogurt mix in springtime. The firm texture of cooked fingerlings makes them perfect for simple Indian curries, too. Add shrimp, peas, and chopped fresh cilantro to make dinner.